The Peace Corps Partnership Program connects interested groups or individuals to the pressing needs in developing communities where Peace Corps Volunteers serve. Since its inception in 1964, the Partnership Program has helped thousands of Peace Corps Volunteers implement community-initiated projects that have had significant and positive impacts on communities and thousands of individuals. The Partnership Program does not directly fund projects, but serves as a link to groups, foundations, service organizations, and individuals wanting to contribute to the valuable work Volunteers do with their host communities. By establishing this link between donors and communities overseas, the Partnership Program facilitates an understanding among different cultures and the opportunity for cross-cultural exchange. Volunteers are invited to submit proposals to the Partnership Program to obtain financial assistance in support of community projects. By assisting community members in the application process, Volunteers become active players in promoting people-to-people assistance. In order to receive funding through the Partnership Program, a community must make a 25 percent contribution to the total project cost and outline success indicators for the individual projects. This helps ensure community ownership, a greater chance of long-term sustainability, and, ultimately, success. RPCVSF schedules approximately four Partnership Dinners each year, at restaurants recommended by RPCVs. 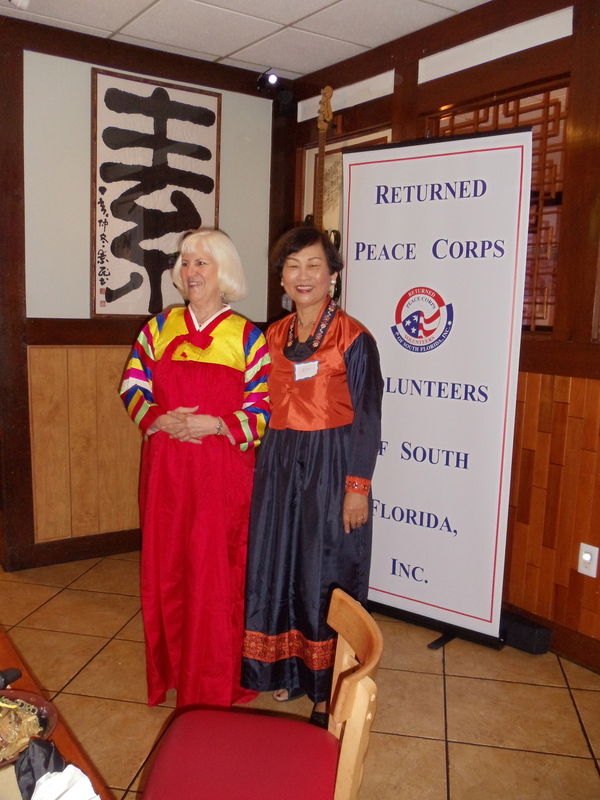 In November 2013 we enjoyed a Korean buffet in Miami (pictures below), and in January 2014 we visited a tropical/Caribbean-themed restaurant in Jupiter. We had a great buffet at a Nigerian restaurant in April 2014, and tasty Indian-Bangladeshi food at Bengal Indian restaurant in July 2014. Please feel free to recommend a restaurant for our next Partnership Dinner. November 2013 - dinner at Shilla Korean restaurant. Tim O'Brien (RPCV Korea '67-'73) and his wife Hyon gave a great presentation on current Korean affairs. Steve Rawlins (RPCV Korea, '71-'72), is pictured with Tim and Hyon, and Doris Vincent (RPCV Venezuela, '64-'66) is pictured modeling a Korean dress with Hyon, and RPCVSF Board Member Linda Lubin (RPCV Kenya, '04-'06, Gambia '10-'11) is smiling among friends including Alex Diaz (RPCV Mali, '02-'03) and Liz Whitney (RPCV Gabon, '01-'03) at the dinner table.